Most organizations are operated with a group of individuals or by a team, and the receptionist is a member of that team. The receptionist works in what is called the ‘Front Office’. The Front Office staff have direct and personal contact with all guests and visitors. This makes the reception desk the focal point of any organization. Help the guests/visitors with any queries or problems that may arise. Though all receptionists have much in common, their specific duties may vary from organization to organization. 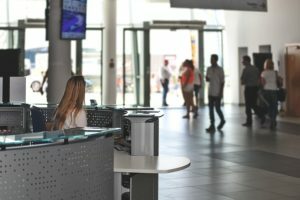 It is quite likely that in a big hotel a receptionist has only to receive guests, whereas in a small hotel she attends to enquiries, reservations and book-keeping as well. Sometimes the receptionist does the work of a telephone operator. A receptionist is briefed about her duties at the time of appointment. But there are certain other bits of information that she will have to learn on the job. Good knowledge of the structure of the hotel/office, the main departments of the employees, and office procedures are among the other things a receptionist also knows. Forms and brochures like reservation voucher, etc. Courtesy and good manners are the two prime requirements for a receptionist’s job. The guests and the visitors should be treated courteously even when they are impolite. This, plus a friendly tone of voice, becomes all the more important in case of unavoidable delays. A certain amount of tact and diplomacy is also needed in dealing with complaints or awkward situations and in handling difficult guests. A receptionist represents their organization; They are the contact point between their organization and the outside world. Therefore, they should be formal, pleasant and efficient. They have to maintain the right tone through their voice, gestures and language. Subscribe to SAR Publisher and Support my YouTube Channel.